Create a manifest file to identify the S3 files you want to import, using one of the formats specified in Supported Formats for Amazon S3 Manifest Files. Check Data Source Limits to make sure your target file set doesn't exceed data source limits. Either save the manifest file to a local directory or upload it into Amazon S3. In the FROM NEW DATA SOURCES section of the Create a Data set page, choose the Amazon S3 icon. Choose URL and type or paste in a URL for the manifest file. You can find this in the Amazon S3 console by right-clicking on the manifest file, choosing Properties, and looking at the Link field. Choose Upload and then choose Upload a JSON manifest file. In Open, browse to a file, select it, and then choose Open. 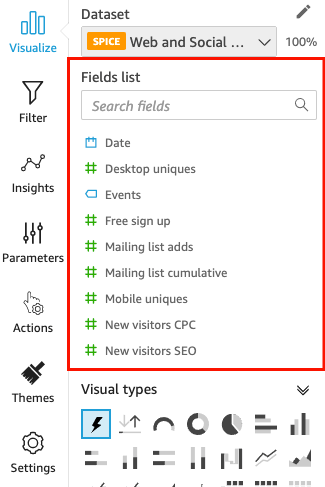 In the Fields list pane of the analysis page, choose the fields you want to use. Amazon QuickSight creates the visual, using AutoGraph to determine the most appropriate visual type for the fields you selected. For more information about AutoGraph, see Using AutoGraph. For more information about modifying the visual, see Working with Amazon QuickSight Visuals.